To enroll in a Medicare Supplement plan in Michigan, you need to have Original Medicare in place. Some insurers will allow you to apply a few months before you take Medicare benefits, so you can make sure you have your coverage ready in time. Most retirees take both Part A and Part B at age 65, but that’s not always true. For instance, about 19 percent of Michigan’s beneficiaries qualify earlier because of a disability. Some folks delay Part B because they still have other coverage from a job, union, or another source. Would a Medicare Supplement plan in Michigan help you manage your own Medicare medical costs? If so, be sure to use our quote form to start your quote online. We also have a toll-free number that can connect you with a qualified Medicare insurance agent. Virtually every beneficiary extends their coverage with private plans or Medicare Supplement plans. In average counties, about 20 to 25 percent of Medicare beneficiaries may choose Medicare Supplement plans in Michigan. Typically, the rate of beneficiaries who choose a Medigap plan over other options tends to be higher in areas that have sparser populations or higher incomes. As you learn more about the way that Medicare Supplement plans work, you will understand why this is true. The easiest time for most people to apply for a Medigap plan is when you are first eligible for Part A and B of Original Medicare. This is because you get six months of guaranteed enrollment rights that begin on the month you first qualify, usually at age 65. This is called an Open Enrollment Period, but it’s different than the period every fall when you can enroll in or switch Part D and MA. You may also qualify for other guaranteed enrollment periods to apply for a Medicare Supplement plan if you move in or out of a plan’s service area, lose current insurance, or for a few other reasons. During that first guaranteed issue period, you can choose any Medicare Supplement plan in Michigan; however, your choices may be limited during other times. How Rates Calculated for Medicare Supplement Plans in Michigan? The insurer will offer you an initial premium based on your age at the time of issue. They must always base their rates upon this age, but they may be allowed to increase prices because of inflation and certain other factors. In this case, the company will base the rates for your Medicare Supplement plan upon your age and can keep increasing rates as you age. These plans will seem cheaper when you are younger, but they may get more expensive later. These Medigap plans don’t use your age, but they do base their quotes upon a rating for the local community you are in and may be able to increase rates for inflation and other reasons later. Does Your Hometown Impact Rates For Medicare Supplement Plans in Michigan? Your state, county, and even your local ZIP can affect your rates because the cost of average medical care depends on lots of local factors. You may not know this, but Medicare keeps track of where they spend the most money, and it varies considerably by city or county. Which Medicare Supplement Plans Should You Compare? Traditionally, this has been the most popular of all of the different plans. It covers every one of the benefits allowed for one of these plans. This is almost like Plan F, but it won’t pay the Part B deductible. Compare the difference in rates against the deductible cost. It might save you money. This has more cost-sharing in place, so you may have to pay a copay for doctor’s visits and some trips to the ER. Also, it will not pay if providers charge more than Medicare allows. It will have lower premiums than the 2 options above. 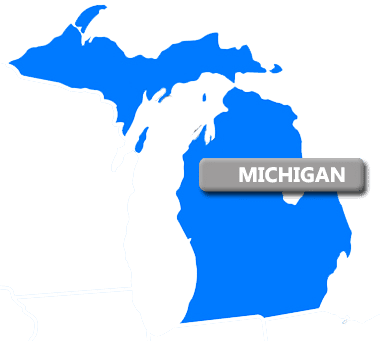 Can My Michigan Medicare Supplement Plans be Used in Another State? If you hope to travel around for several months of the year, you will probably be happy to learn that most Medicare Supplement plans are entirely portable all around the country. Some even offer benefits for urgent medical care in other countries. One of the reasons that many beneficiaries appreciate their Medigap plan is because of its portability. Note that “Select” plans do use networks and are an exception to this. If you want to save money by choosing Medicare Select, make sure you understand how the network rules work. Also, check reviews to make sure that current members have been happy with their treatment by the network plan. If you plan to change your home address, you should tell your Medigap plan provider. Your premium might be a little different from your original Medicare Supplement Plan in Michigan as rates are determined by zip code. We give you the chance to compare Medicare Supplement plans and rates online with our handy quote boxes. Get started by selecting Michigan from the drop-down box. If you’d rather not shop online, you’re also welcome to use the toll-free number to call us. We just want to help you find the best Medicare Supplement plan for your needs and budget.